An oven baked hamburger with a gooey cheese filling. Beware of cheese burns when eating this. There are several ways to enjoy cheeseburgers. 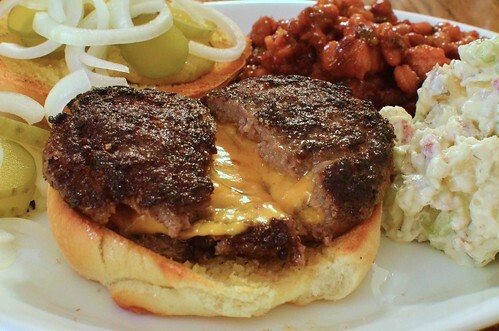 The most popular and most common is to slap a piece of American cheese on top of the pattie. What could be easier. Well, that's plain boring. Why not try stuffing the cheese into the meat patties? The easiest way to stuff cheese into a hamburger is to cut American cheese into small pieces and sandwiched them between 2 meat patties. But have you consider injection? Cooks have long been using syringes to inject liquids into drier meats like turkey to increase the moisture and ensure the meat is juicy and tender. With a bigger needle, melted cheese can be drawn into the syringe and injected carefully into the middle of the patty. This will ensure gooey goodness. The velveeta cheese is melted first and then injected into the meat patties using a meat syringe like this Bayou Classic 5011 2-Ounce Stainless-Steel Seasoning Injector with Marinade Needles. These "loaded" patties might break on the grill which is why they are ideal candidates for the oven. Allow the burgers to cool for about ten minutes before serving them to avoid cheese burns!